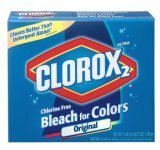 Clorox remains segregated, with Clorox for Whites and Clorox 2 for Colors. For those without comedic tastes, the so-called experts at Wikipedia think they have an article about Segregation. Segregation is the practice of separating laundry solely on the basis of color. In the United States, the practice of segregation began just after the American Civil War and continued until the mid 1960s. Though now looked down upon by most western countries, segregation was at one time the standard for people throughout the world. Prior to the American Civil War, colored clothing did not exist. It was not until the beginning of Gone with the Wind (which was sometime mid-Wizard of Oz) that color was invented. Shortly after that, in the northern United States, color became more accepted. Many people began to wear colored clothing, with blue being the favored color. Those in the southern part of the country denounced and rejected this practice, believing that colors should be restricted to the fields and the outdoors, and should not be paraded around in public view. This disagreement led to war, pitting the more open-minded Northerners in blue against the stubborn Southerners in black and white (sometimes called the Grays). The Southerners would eventually don gray uniforms and throw (mostly) gray colored rocks in the following war over segregation. During the war that ensued, Abraham Lincoln penned the Epantsimation Proclamation, which did just what the Southerners had feared. It allowed colors to be distributed freely about the country. Those Southerners who sided with Lincoln became known as "People of Color". However, many still opposed the freeing of color. These White Supremacists gathered together and formed an organization known as the Clorox Clan. These men would dress in pure white robes and hoods, and persecute the people of color, believing that the United States was founded in whiteness and should remain that way. They feared that the colors would mingle and blend with the whites, and ruin the purity of their clothes. Separate but Equal settings were placed on washing machines for whites and colors. The situation became tense after this, and an uneasy compromise was reached. Separate facilities would exist for white and colored laundry. In addition, colored clothing was to be washed only in cold water. This practice continued for decades, and when machine laundries and laundromats came into being, separate machines were used to wash clothes, as well as separate detergents and bleaches. Finally, in 1962, laundromat and dry cleaning business owner George Jefferson challenged segregation, stating that these laws forced him to purchase twice the machines than were actually needed. Following Jefferson's challenge, separate settings were put on the machines for whites and colors. This, however, still did not solve the problem of separate detergents. Jefferson continued his fight, and eventually won, forcing detergent manufacturers to make one detergent for whites and colors. One company, "Apartide", changed their name to remove the word 'apart', and became simply 'Tide'. Another detergent maker, to show their inclusiveness, called themselves 'All'. Meanwhile, in the sporting world, major sports teams were experimenting with desegregation. In Major League Baseball, an attempt was made to merge the Chicago White Sox with the Boston Red Sox. This led to the creation of the Pennsylvania Pink Sox. This merger caused such an uproar that the Major League Baseball was forced to separate the teams once again. After this, the White Sox players began to wear black to prevent any future colors from ruining their clothes. It is rumored that the creation of the "Pink Sox" may not have been intended to battle segregation but in fact was the result of a tragic laundry incident involving confusion around which settings to use. In the end, most people now welcome colors in their everyday lives, and freely wash colors in the same machine, and often in the same load, as whites. The Clorox Clan remains, however, and still manufacture separate bleaches: Clorox for whites, and Clorox 2 for colors. This page was last edited on 17 November 2014, at 20:41.